Welcome to the Stelzer group! A major goal of the Physical Biology Group (AK Stelzer) is to pursue experiments in the life sciences under close-to-natural conditions. Hence, its members favor primary cell lines and try to avoid experiments with cultured cell lines, they favor three-dimensional cell cultures over two-dimensional cell monolayers that are cultivated on hard and flat surfaces and they try to maintain the three-dimensional context of plants, cell clusters, tissues sections and small animal embryos. In consequence, many specimens are relatively large, optically dense and require advanced methods in terms of preparation, maintenance, visualization, data handling and data analysis. Overcoming the limitations of confocal fluorescence microscopy, we invented and developed light sheet-based fluorescence microscopy (LSFM) establishing it as a major tool in the modern life sciences. A LSFM uses two independent, azimuthally arranged optical paths to excite the fluorophores in a specimen and to detect the fluorescence emission. The laser beam is channeled through the illumination lens and creates a thin light sheet that overlaps with the focal plane of the detection lens. In consequence, only a thin volume of the specimen is exposed to the laser light, which provides true optical sectioning. The benefits are reduced out-of-focus blur and no photo-toxicity or photo-bleaching outside the illuminated volume. We used our single plane illumination microscope (SPIM) to record the first non-invasive long-term fluorescence live imaging study of the fruit fly Drosophila melanogaster in 2004. Fully digital beaming scanning light sheet microscopes (DSLM) provided recordings of the developing zebra fish Danio rerio in 2008 and of the red flour beetle Tribolium castaneum in 2014. Since 2010 we have been imaging various aspects of plant development. We apply our LSFM to investigate the development of Arabidopsis thaliana’s root system (Maizel et al. 2011). Close-to-natural growth conditions (e.g. upright position, roots in liquid and leaves in air, maintenance of a 16 hrs / 8 hrs diurnal cycle) are essential for observations lasting multiple days. We have successfully established a complete plant imaging pipeline. The careful sample preparation and fluorescence light microscopy under close-to-natural conditions allow us to image large volume elements in plants with subcellular resolution. Our image processing applications identify cells in three dimensions and as a function of time. A careful analysis allows us to track nuclei movements over time, to determine when cell divisions occur, to measure the orientation of daughter cells in three dimensions and to generate the complete lineage of all cells (von Wangenheim et al. 2014; Rosquete et al. 2013; Lucas et al. 2013; Vermeer et al. 2014). Most group members establish and apply tissue and spheroid technologies for both fundamental and applied as well as translational, research. We develop three-dimensional cultures of cell spheroids for drug and toxicity screening purposes. We collaborate with industrial partners as well as with academic partners and the University’s Clinics. Spheroids serve as models for the development of healthy tissues and their maintenance in the living organism but also as models for tumor growth (Pampaloni et al. 2007). We currently evaluate the therapeutic benefits as well as the toxicity of drug candidates in spheroids by means of conventional fluorescence microscopy as well as LSFM and many different biochemical and molecular biology-based assays (Ansari et al. 2013; Wenzel et al. 2014; Pampaloni & Stelzer 2010). Optical clearing matches the refractive index of the mounting medium to the refractive index in the biological specimen. Several procedures essentially make opaque samples transparent. We test and apply optical clearing protocols on macroscopic and microscopic samples including tissue specific variations of these protocols. Fluorescence imaging of small specimens is performed with high numerical aperture lenses in our DSLMs. Specimen clearing is used in many projects that relate to three-dimensional cell biology. Our customized data processing software relies heavily on Mathematica. It is used in the development of an agent-based three-dimensional computational model for the initial phase of spheroid formation, in the development of image analysis procedures and in the segmentation of cell nuclei in two-dimensional and three-dimensional data sets. For example, based on our understanding of spheroid formation, we have phrased a biological hypothesis for a mathematical model, in which key variables were identified and two complementary modelling approaches implemented. We develop systems of ordinary differential equations to address the generic features of the initial phase of spheroid formation and an agent-based three-dimensional computational model to focus on spatial differences in the process. We established the red flour beetle Tribolium castaneum as an EvoDevo model organism in our group and developed a non-invasive long-time fluorescence live imaging protocol for Tribolium embryos for our LSFMs. By using a new mounting technique, we became able to observe Tribolium embryogenesis for up to 50 hours along multiple directions, documenting all major embryogenic events such as gastrulation, germ band elongation, germ band retraction and dorsal closure continuously in the same specimen. The embryo survives the imaging process, develops into an adult and produces fertile progeny. Our long-term observations allowed us to find correlations between morphogenic processes that happen more than 24 hours apart, for example the serosa scar, a transiently formed structure that links serosa window closure during gastrulation and serosa opening during dorsal closure (Strobl & Stelzer, 2014). Statistics play a fairly important role in all aspects of the modern life sciences. It is particularly important to prove that the findings are robust in terms of cell type, environmental conditions and compound concentrations to mention a few aspects. Therefore, we require light microscopes that are capable of handling a dozen to about a hundred specimens within a short period of time, of producing a fairly large number of images that are easily evaluated with modern software and of generating quantitative information. All technologies and of course all light microscopes have a certain operating window, i.e. they operate well within a certain range of parameters. E.g. a conventional fluorescence microscope can easily produce ten bright images per second but does not provide axial resolution. On the other hand a confocal fluorescence microscope will provide an excellent axial resolution but exposes the specimen to high energy levels and might require several 10s of seconds for each image. Modern research takes advantage of many different techniques and it is fairly common to kind of zero in on a specimen. Coarse grain searches are used initially to perform an early selection and finally high resolution techniques are used to identify the actual specimen of interest and to address aspects related to scientific issues. In consequence, we require a number of different microscopies that can be applied at different stages of an investigation. 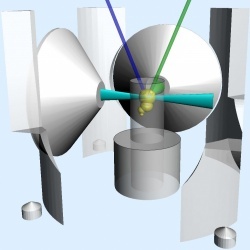 In more modern terms, we require a microscopy pipeline that allows us to use the instrument that is most appropriate at a certain stage of the experiment. The formation of spheroids may serve as an example. As long as we look at the rapid movements during the single cells and mono-layer stages, conventional transmission and fluorescence microscopes are sufficient. Multiple cell layers require a moderate axial resolution but still a high frame rate, which is provided by a spinning disc confocal fluorescence microscope. Fully developed and drug-affected several hundred µm thick spheroids are not very dynamic but require confocal and light sheet-based fluorescence microscopy for a full analysis of the spatial distribution of several fluorescing targets. LSFM are now used by hundreds of scientists around the world. Well over a dozen different concepts have been implemented by various groups and some are even applied in the modern life sciences. 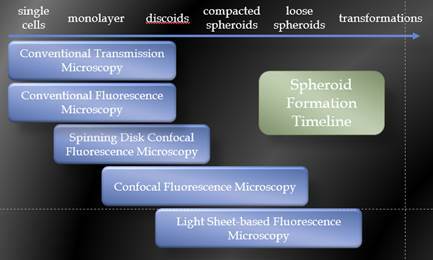 We continue to develop new LSFMs, which are based on our SPIM and DSLM concepts to improve the image recording speed, to improve the spatio-temporal resolution and to simplify the usability, thus, not only exploring further niches but eventually developing areas of research that never been touched by modern microscopy before.